Over the past seven years, local beneficiation, adopted as a mantra by the departments of Mineral Resources and Trade and Industry since 2011, has made some progress. Beneficiation is a particularly South African term, although most other countries have a similar policy. It means advancing South Africa from its current focus on exporting raw mineral resources towards adding value to make products with higher export sales value and create more skilled jobs. It implies everything from large-scale, capital-intensive smelting and refining to labour-intensive activities, such as jewellery-making. This is not a new path for South Africa. It has had some notable successes in creating downstream industries in the past century. One is Rand Refinery, established in 1920. Its 22-carat Krugerrand coin, which is now the world’s most actively traded gold coin, helped boost demand after the collapse of the gold standard in 1971. Krugerrands were mass produced to enable ordinary investors to buy gold easily and with confidence. Since the 1970s the Krugerrand range has been expanded and, in June 2018, the Rand Refinery, in a joint venture with the South African Mint, launched the first-ever silver Krugerrand. 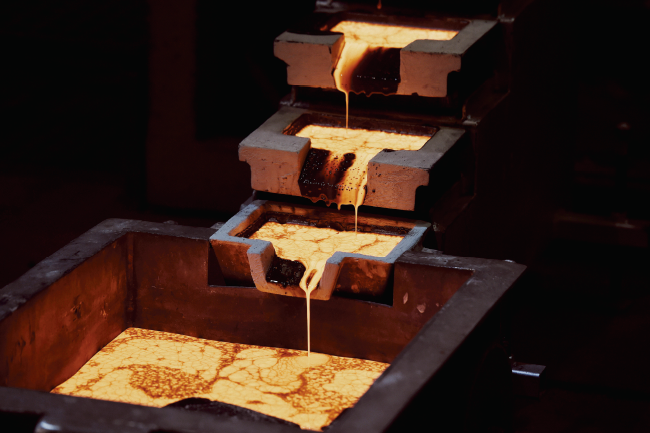 ‘The Krugerrand is probably the best example of South Africa’s gold beneficiation efforts,’ says Rand Refinery chief executive Praveen Baijnath. ‘In its almost 100 years of existence, the Rand Refinery has refined over 50 000 tons of gold – about one-third of the total amount ever mined.’ Another homegrown success is Sasol, founded in 1950 with government support, which makes liquid fuels and chemicals from local coal and Mozambique gas at its plants at Secunda and Sasolburg. Over the past 30 years Sasol has become an increasingly significant global chemicals producer. Experts agree that beneficiation should be driven through a concerted political will, as policy decisions and orientation towards beneficiation has a strong correlation with the proper utilisation of minerals. South Africa has myriad resources that lend themselves to local beneficiation, including an abundance of certain mineral reserves; a competitive advantage in various mining/smelting activities; R&D programmes and beneficiation experience at higher levels. The government’s Mineral Beneficiation Action Plan, drafted in 2011 and later incorporated into the Industrial Policy Action Plan, focuses on five areas, namely iron ore and steel; platinum group metals (PGMs); polymers; titanium; and mining inputs. Beneficiation is included in the draft Mining Charter III, which allows mining companies to offset up to 5% of the BEE ownership requirement through local beneficiation. Although the advantages of local manufacturing are obvious to everyone, the government initially aroused opposition from mining companies by threatening to legislate an obligation for mining companies to supply local industries at below international market prices. 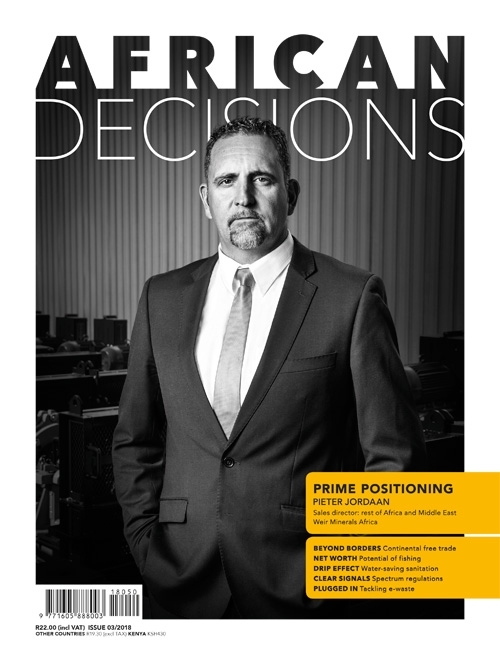 Wickus Botha, Africa mining and metals leader at EY, says the country’s mining industry is not opposed to beneficiation and that it has actively sought beneficiation opportunities. But it was opposed to attempts earlier in the decade to mandate beneficiation in areas where South Africa has no competitive advantage over the Far East, such as cheap, mass-produced goods, or where beneficiation moves into the area of manufacturing, as in jewellery fabrication. Botha says there are certainly opportunities for local beneficiation of raw minerals where there are backward or forward linkages with existing industries, or in high-value goods where there are niche opportunities, such as high-carbon steel and chrome products, manufacturing of solar panels and batteries. Another important element in stimulating beneficiation is incentives, says Botha. South Africa’s success in attracting global automotive manufacturers is due to the incentives it has offered. Yet beneficiation needs a stable and affordable electricity supply, which is not available at present, adds Botha. Throughout North West and Mpumalanga there are still several smelters that have been either moth-balled or are on care and maintenance. In 2014/15 Eskom implemented several months of loadshedding as a result of a backlog in maintenance, in the midst of a decade in which its tariffs had risen fourfold. This has rendered power-intensive industries such as refining and smelting impractical. Since 2011, South Africa’s existing steel-making, aluminium, ferromanganese and ferrochrome activities have dwindled. Some manganese and chrome companies have moved their smelting operations to other countries that provide cheaper electricity. ‘We have witnessed a slow progress in implementing beneficiation, which was adopted as a policy of government in 2011,’ Mineral Resources Minister Gwede Mantashe admitted during his department’s budget vote in May 2018. A few months later, at the annual Africa Down Under conference in Perth, Mantashe said government was looking at commodity price-linked power pricing to encourage more local smelting and beneficiation. 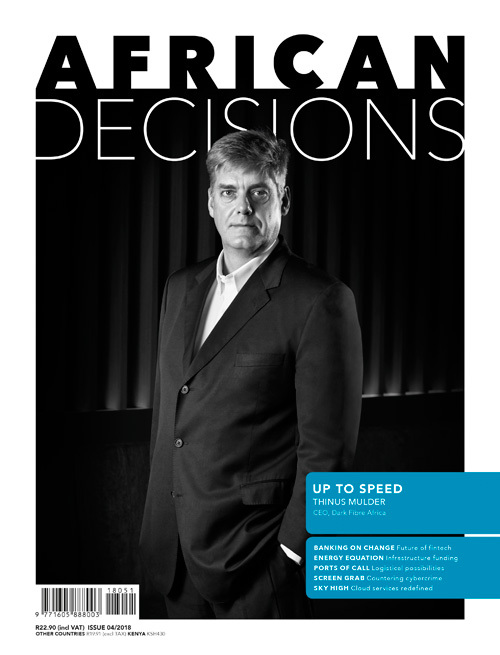 Despite the constraints, there are various beneficiation initiatives on the go, although it is too early to judge whether there is another Sasol-type success in the pipeline. Work is under way at various sites to test and refine hydrogen fuel cells that use platinum as a catalyst. 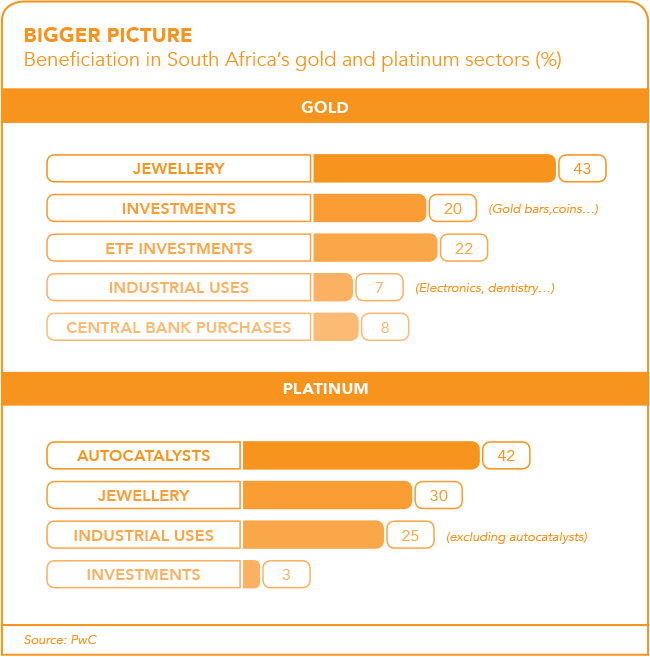 South Africa is the world’s biggest producer of platinum. ‘The hydrogen fuel cell programme is gaining traction and serves as an excellent case of the beneficiation of platinum,’ Mantashe told Parliament in May. He singled out work being done at Mintek to scale up catalyst production and produce membrane electrodes for direct methanol fuel cells. Mintek was also assessing new commercial uses of platinum, for example, in the pharmaceutical and chemical sectors. The Department of Science and Technology, through its Hydrogen South Africa programme (which will run for 15 years), aims to develop the country’s intellectual capital in hydrogen and fuel cell technologies. It seeks, among other things, to find cost-effective and sustainable ways to incorporate PGMs into hydrogen fuel cells and other technologies. Anglo Platinum partnered with Ballard Systems, Eskom and the Department of Energy to develop the world’s first fuel cell electrification grid – developing mining equipment fuelled by fuel cells and funding research into PGM uses in South Africa and the UK. 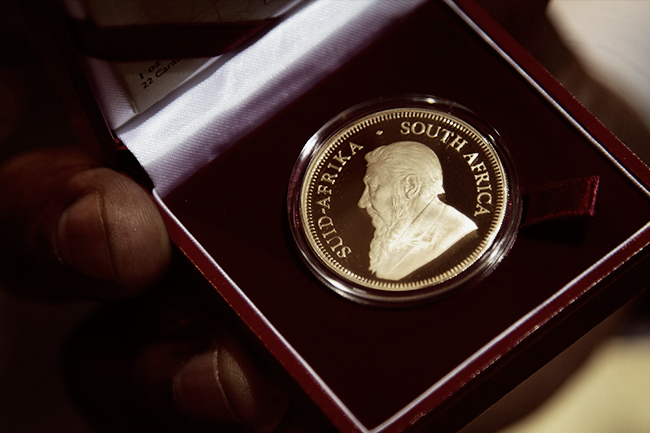 For several years the platinum industry has been lobbying the government to try to repeat the success of the gold Krugerrand with a platinum coin. Although the South African Reserve Bank noted in 2017 that its studies showed a platinum coin was not viable, Mantashe said at the Platinum Group Metals Conference in Randburg in September 2018 that talks were under way with National Treasury to produce a platinum Mandela coin to stimulate platinum demand. ‘Rand Refinery’s beneficiation initiatives are centred around the Gold Zone, an on-site manufacturing centre aimed at becoming a hub for precious metals fabrication in South Africa for global export, while assisting local communities with skills development,’ says Baijnath. It runs two skills development programmes: the Intsika and Ekurhuleni jewellery projects. Intsika, says Baijnath, ‘offers jewellery design and manufacturing training to formerly unemployed youth from the surrounding community, while the Ekurhuleni jewellery project functions as an incubator for young black jewellery manufacturers’. Another mineral in which South Africa has a leading position is vanadium. London-listed Bushveld Minerals, through its subsidiary Bushveld Energy, supplies vanadium for a vanadium redox flow battery (VRFB) suitable for utility-scale power generation, which Eskom is testing. In addition, Bushveld is working with the Industrial Development Corporation on plans to establish electrolyte production at its Vametco site and in the East London industrial development zone (IDZ). An environmental impact assessment is under way at a site in the IDZ and is due to be completed in the first half of 2019. Bushveld Minerals is a primary producer of vanadium and its vision is to become a vertically integrated company, producing vanadium, manufacturing electrolytes and developing and deploying VRFBs. 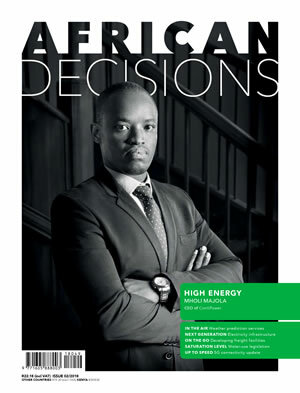 ‘Bushveld Energy presents arguably the deepest vertical integration to resonate with the beneficiation and local content manufacturing aspirations of the South African government,’ according to Bushveld Minerals CEO Fortune Mojapelo. 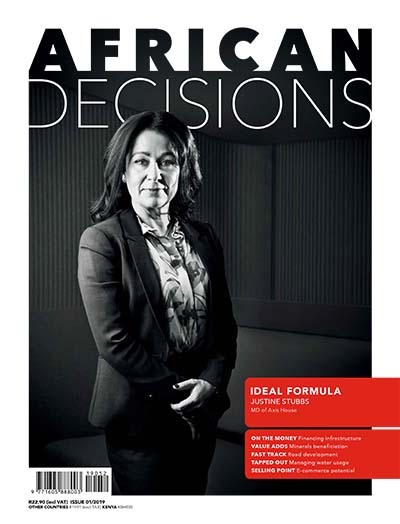 The Department of Science and Technology is funding research at the CSIR into new ways of manufacturing titanium metal powder, with uses in a range of industries from aerospace to 3D printing. South Africa has the world’s second-largest deposits of two titanium ores, ilmenite and rutile. With upsides, however, also come downsides. For example, one of the least successful beneficiation initiatives to date has resulted from the South Africa government’s intervention in the diamond cutting and polishing sector. In 2005 the Diamonds Amendment Act was passed, empowering a new entity, the State Diamond Trader, to buy 10% of the run of mine production by value from South African diamond miners to sell to BEE businesses for local beneficiation. Instead of growing the local diamond cutting and polishing sector, the effect was to shrink it. World Federation of Diamond Bourses president Ernest Blom told Mining Weekly in June 2018 that the local diamond beneficiation industry had fallen over the past 20 years from 4 500 diamond polishers to fewer than 300. He said the main reasons were that the cost per carat of polishing diamonds in South Africa was four times higher; it took longer; and produced a lower-standard product than India or China. This was partly because of inadequate training programmes for local cutters and polishers. The huge investment made decades ago by what is now South32 in South Africa’s aluminium smelters showed that local beneficiation does not depend on having local raw materials. The smelters used imported alumina, but they depended on a cheap, reliable and plentiful supply of electricity. For a country to beneficiate successfully, it needs a cost advantage – whether in skills, location or power – and, more importantly, supportive government policies.